Most people who start a real estate career are not set up for success from the start. Many new licensees enter the business with unrealistic expectations of big deals, nice cars, and instant success. What they don’t realize is that success, just like a paycheck, isn’t guaranteed when you choose to start a career in real estate. There are really two types of new agents: 1) People who have previous sales experience; 2) people with no, or very limited, sales experience. Both have distinct advantages. But both also face unique challenges that can become pitfalls between licensure and success in this business. This group usually comes to real estate with a solid understanding of how business works. They have experience with systems for accountability, and they know how to conduct themselves in a competitive sales setting. Because of that prior experience, they have a leg up on Group 2. But they still often stumble when starting a real estate career. They usually have no knowledge of how the real estate industry operates or the anatomy of a real estate transaction. This group sometimes comes into their new real estate career with a healthy ego and an unrealistic expectation that real estate is just like their old career, but with a different product. But in real estate, we don’t sell products. We represent people. This group gets into trouble early because they often have a mindset that makes them super-focused on the fastest path to commission, instead of doing what’s right for the client. Group 2 comes with their own unique challenges. This group includes young people, fresh out of high school or college, as well as career changers whose previous work experience was not in a sales-driven role. They have to learn the real estate business, just like group one. But they also need to learn some of the basic principles of how to run a business, deal with people, and manage the day-to-day tasks that drive the business. They’re not used to hearing “no,” like a seasoned sales professional is. This group needs to be monitored. They require a lot of encouragement. Someone has often led them to believe that selling real estate is easy. So, the realities of what it takes to be successful can sometimes be crippling to their confidence. The obstacles to success are greater for these people, but they often make the best real estate agents if they’re able to stick with it. They can be molded and, if trained well, can be very successful in this field. There are successful agents who followed the Group 1 path to their real estate career, and there are successful agents who followed the Group 2 path. But there are a lot of people from both groups who have started a real estate career and ended a real estate career in the same year. People emerge from their prelicensing course ready to pass their state licensing exam. But they don’t necessarily possess the actual business knowledge needed to market themselves, develop client relationships, and provide exceptional client service. Technology has made it easier and more affordable than ever to perform the daily work of a real estate agent. Expensive newspaper ads, mailers, and door-to-door prospecting have been replaced by sophisticated websites, email, and social media. But technology has also made the business more competitive, and widened the gap between those with the knowledge and drive to succeed, and those who don’t know where to start. Brokerages across the country are failing with newly licensed agents. Small brokers simply don’t have the time, money, or resources to effectively train a new agent. Large brokerages may have better access to training materials and the ability to provide dedicated mentors, but they lack a truly functional training program, and often don’t have people on staff with the unique skillset required to teach. While a larger firm may have a training program, new agents sometimes get lost in the crowd and find it difficult to actually apply their limited training to the real world, without anyone guiding their first steps or helping them stay accountable. Newly licensed real estate agents are entering the business without knowing where to start. And brokerages are traditionally not set up well to help them create and execute on a plan for success. As a result, a number of promising real estate careers are cut short before they really have a chance to begin. The industry is primed for a change in the way we educate new agents. The prelicensing instructor is often a new agent’s first contact in the business. The school where they completed their education feels comfortable. Most students leave the prelicensing classroom with glowing praise and a fond appreciation for the school that helped them earn their license. 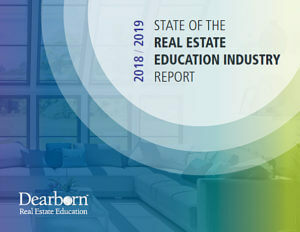 Real estate schools across the country have an opportunity to build on that inherent trust and provide the education that will help students accelerate their journey to success. A curriculum that teaches new agents how to manage contacts, develop and execute business and marketing plans, conduct business with confidence and accountability, and distinguish themselves in a crowded marketplace would be invaluable to the industry as a whole. As a broker myself, I would be much more willing to take on new agents if they came to me with these fundamental skills, or if there was a school I could send them to that could provide the training. Clients rely on the agent to be an expert, a support system, and a guide through the buying or selling process. But most new agents enter the industry afraid. They’re either afraid of success or afraid of failure, but that fear chips away at their confidence. Without confidence, they’re simply not set up to be what the client needs. The gap between licensure and success is real. But that gap represents a serious opportunity for real estate educators to grow their business and have a very positive impact on the real estate industry as a whole. Aimee Hanson is the vice president and primary broker of SPARA Realty, a residential real estate firm based in St. Paul, MN. Since 2010, she has also served the industry as a real estate instructor and author. Most recently, she co-authored Dearborn’s new Real Estate Accelerator course, designed to help new and under-performing real estate professionals develop the knowledge, skills, and processes they need to be successful.